Competition in Indonesia’s dynamic domestic market has increased another notch with the launch of Sriwijaya full-service subsidiary Nam Air. Sriwijaya, Indonesia’s third largest airline group after Lion and Garuda, is using Nam to expand its presence in the fast-growing regional market. Nam Air commenced operations on 10-Dec-2013 and is currently operating one daily Boeing 737-500 flight between Jakarta and Pangkal Pinang, a trunk route also served by Lion, Garuda and Sriwijaya. Six more domestic routes are planned as part of Nam’s initial phase, including five routes connecting secondary markets which are new to the Sriwijaya group. Four of these routes are currently not served by Lion or Garuda. Sriwijaya could have used Nam to enter the budget end of the market, which has accounted for most of the recent growth in Indonesia but has become fiercely competitive. The group has instead positioned Nam as a full-service carrier with a similar product to Sriwijaya Air but a different network strategy, targeting point-to-point markets which are relatively thin but are underserved and have big potential. Privately-owned Sriwijaya is not well known outside Indonesia but is among the top 10 airline groups in Southeast Asia based on current seat capacity. Sriwijaya Air is predominantly a domestic operator, serving about 40 destinations (only three of which are international) with an all-737 fleet of approximately 35 aircraft. Sriwijaya Air is considered a full-service carrier, providing frills including complimentary snacks and drinks, but has offered low fares competitive with LCCs. Indonesia licences carriers under three categories – low-cost, medium and high. These are based on service level and the government also sets slightly different domestic fare caps for each category. 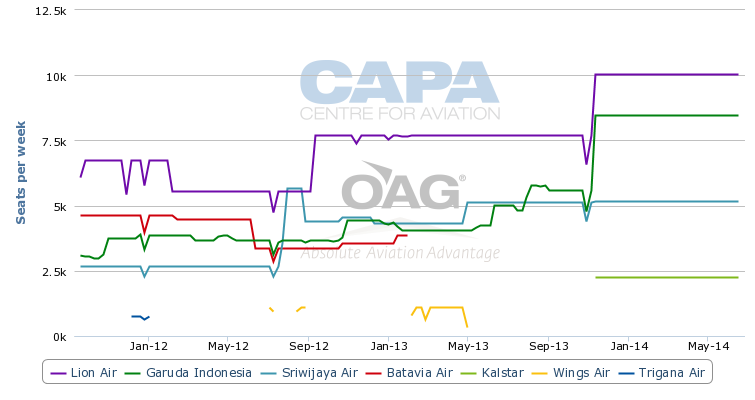 Sriwijaya Air falls under the middle category. As CAPA reported in Jan-2013, the initial plan was for Nam Air to be positioned at the top end of the market, where Garuda and Lion Air full-service subsidiary Batik Air now compete. The intention was for Sriwijaya and Nam brands to operate side by side on trunk routes with Nam providing a two-class product similar to Garuda and Batik, including hot meals in both classes. But Sriwijaya has instead decided to use Nam primarily as a regional carrier on routes not already served by the group. Nam is now intended to be a feeder for Sriwijaya while also catering to growing demand for point-to-point services which bypass Jakarta. The revision to Sriwijaya’s two-brand strategy is logical, as the differentiation initially between Sriwijaya and Nam seemed very small, which could have led to some passenger confusion. While Sriwijaya Air often competes with the LCCs on price, the carrier introduced in early 2012 a business class product on some routes in an attempt to reposition it to serve the top end of the market. Launching Nam as a separate premium brand seemed a mere duplicate. Sriwijaya has acquired over the past two years several ex-United Airlines 737-500s which it has kept in United’s original two-cabin configuration. It also has retrofitted some of its other 737-500s and 737-800s, which were introduced in early 2012. The group currently operates four 737-800s and 17 737-500s, including five 737-500s which have been allocated to Nam Air, according to the CAPA Fleet Database. Sriwijaya also has 12-737-300s and six 737-400s, all of which are listed as still being operated in single-class configuration. The group has an ageing fleet – the average age of its in-service fleet is about 20 years and even the carrier’s 737-800s were manufactured in 1999. With a business class product now sold as part of the Sriwijaya main brand offering, it does not make sense to have a separate premium brand. Garuda has clear differentiation with a full-service two-class product at its main brand and Citilink offering a no frills single-class product on several overlapping routes. Lion Air, meanwhile, has just phased out its business class product, retrofitting the relatively small portion of its 737 fleet which had been in two-class configuration. Lion wanted to allow Batik, which launched service in May-2013 with 737-900ERs in two-class configuration, to be clearly differentiated as the group’s only brand competing at the top end of the market. Since Sriwijaya first indicated about two years ago that it planned to establish a new subsidiary, there had been some speculation in Indonesia that its stated intention to launch a full-service carrier was a decoy and the group would ultimately use Nam as a budget subsidiary, resulting in a similar two-brand model to Lion and Garuda. Sriwijaya still has the option later to transition Nam to the LCC model. Having a second operating certificate gives the group flexibility, which is particularly important as there is now a moratorium in Indonesia on approving applications from start-ups seeking to operate scheduled services with aircraft of more than 30 seats. But the budget end of the market has become fiercely competitive, with Lion and Citilink competing with Indonesia AirAsia and Tigerair Mandala. All four of the LCCs have been pursuing rapid expansion, leaving little space for a fifth LCC. There is potentially more opportunity in the regional market as Indonesia’s main trunk routes already are served by seven to eight brands, including the four LCCs. Some regional routes are served by several carriers but there are also growing regional markets which have limited or no non-stop service. Garuda and Lion both now have regional operations. Lion serves regional routes using ATR 72 turboprops operated by its subsidiary Wings Air, which follows an LCC model. Garuda recently started competing in these markets using its new fleet of ATR 72s, which are operated under the new sub-brand Explore. Government-owned regional carrier Merpati and several smaller private regional carriers also operate turboprops, primarily on short island-hopping sectors. But Nam will focus on slightly longer sectors which are generally beyond the economical range of turboprops. With Garuda now starting to compete against Wings on short sectors, there is potentially more opportunity for the Sriwijaya group to enter longer regional or point-to-point routes. Such markets are growing, boosted by economic growth in Indonesia’s secondary cities. Opening new connections between secondary cities also alleviates the congestion at Jakarta, where slots are limited. Nam’s initial network includes two trunk routes that are already served by Sriwijaya – Jakarta to Pangkal Pinang and Pontianak. Jakarta-Pontianak is one of the 10 largest domestic routes in Indonesia while Jakarta-Pangkal Pinang is among the top 20, based on current seat capacity data. But these routes will be exceptions for Nam and are likely being operated because at least initially Nam needs to base aircraft and crews at Jakarta, where Sriwijaya also has its main base and headquarters. Jakarta to Pangkal Pinang, which was launched by Nam on 10-Dec-2013, is also served by Sriwijaya with six daily frequencies. Lion and Garuda are the only other carriers on the route, operating four and two daily frequencies respectively, according to OAG data. The one daily flight from Nam further boosts Sriwijaya’s already leading market share on the route. Prior to the entrance of Nam, Sriwijaya had a 44% share of capacity between Jakarta and Pangkal Pinang. It is unusual for Sriwijaya to have a higher share of capacity on a trunk route than Lion and Garuda. Pangkal Pinang is therefore one of Sriwijaya’s stronger markets although it is a smaller city, with a population of about 200,000. It is located on the island of Bangkal, which is situated about halfway between Jakarta and Singapore and near the southern part of the much larger island of Sumatra. Sriwijaya also serves Pangkal Pinang from the Sumatra city of Palembang. Jakarta-Pontianak, which Nam plans to launch on 19-Dec-2013, is currently served by Lion, Garuda, Sriwijaya and much smaller domestic carrier Kalstar. Sriwijaya also operates six daily flights on Jakarta-Pontianak but as this is a bigger route six frequencies only gives Sriwijaya about a 20% share of capacity. Lion currently has a leading 39% share of capacity between Jakarta and Pontianak while Garuda has about 33%, according to CAPA and OAG data. Pontianak is a medium-size city of about 600,000 on the west coast of Borneo, a large island which is shared with Malaysia and Brunei. On routes the two brands overlap, Sriwijaya is now selling Nam-operated flights interchangeably with Sriwijaya-operated flights. For example, the Nam-operated flight from Jakarta to Pontianak leaves only 30min after a Sriwijaya-operated flight and 30min before another Sriwijaya-operated flight. The same fare is generally available on either of the Sriwijaya flights or the Nam flight, which has a Sriwijaya (SJ) flight number. Nam has established its own website, flynamair.com, but at least for now all visitors are directed to the Sriwijaya website. Sriwijaya sells most of its tickets through travel agents, as is the case with most Indonesian carriers. Nam will be able to leverage Sriwijaya’s strong network of agents. Nam was launched with limited publicity and no fanfare. But Sriwijaya has always been a low profile company. The group has the potential to successfully launch a new subsidiary without having to make a big marketing investment, particularly as Nam will rely on Sriwijaya for distribution and be able to access its relatively loyal frequent flyer base. Nam is also relying on its parent to sell its exclusive regional routes. On its regional routes, only the Nam brand will offer a non-stop product. Sriwijaya Air currently serves these markets with a one-stop or connecting product, and in some cases does not serve the markets at all. Nam intends initially to operate five regional routes with one daily flight each: Surabaya to Palu and Pangkalan Bun; Palu to Luwuk; Semarang to Pangkalan Bun; and Yogyakarta to Pontianak. Sriwijaya has started selling tickets on Yogyakarta-Pontianak flights commencing 19-Dec-2013. The other four routes are also expected to be launched shortly and are included in the Sriwijaya web-based schedule but Sriwijaya has not yet begun tickets sales for these flights on its website. Only one of these five regional routes is currently served by the Lion group, Surabaya-Palu. Palu is on the large central island of Sulawesi. It is currently served by Lion, Garuda and Sriwijaya but only Lion operates the Surabaya-Palu route, also with only one daily flight. Garuda serves Palu from Makassar using its new CRJ1000 fleet. Sriwijaya also only serves Palu from Makassar, which is the main city on Sulawesi. In addition to Surabaya, Lion serves Palu from Makassar, Jakarta and Balikpapan. Luwuk is a smaller city on Sulawesi. Nam will be the only carrier serving Luwuk from Palu, according to OAG. Luwuk is currently only served from Makassar by Sriwijaya and Lion/Wings. Pangkalan Bun is a small city located in southeast Borneo. It currently does not have service from any of the main Indonesian airline groups (Garuda, Lion or Sriwijaya). According to schedule data from OAG, Pangkalan Bun is currently served by smaller Indonesian carriers Kalstar, Kartika and Trigana. These are generally considered to be regional carriers but also operate 737s, including to Pangkalan Bun. Currently there are eight cities served from Pangkalan Bun, including Surabaya and Semarang. Kalstar, Kartika and Trigana all serve the Pangkalan Bun-Semarang route while only Trigana serves Pangkalan-Surabaya. Semarang and Surabaya are both large cities located on Indonesia's most populated island, Java. While Nam will not be the only carrier serving its initial two Pangkalan Bun routes it is unusual for an Indonesian city even of this size that is not yet served by Lion/Wings or Garuda. Sriwijaya sees a potential opening but the launch of Nam service at Pangkalan Bun could lead to Lion or Garuda also entering. Currently no carrier links the medium size cities of Pontianak with Yogyakarta. But Batavia Air served the route before its ceased operations in early 2013, leaving a potential opening for Nam. Yogyakarta is currently the seventh largest airport based on seat capacity while Pontianak is the 15th largest. (Palu, Luwuk and Pangkalan Bun are not among the top 20.) Yogyakarta-Pontianak is a good example of a market that is now served via hubs such as Surabaya and Jakarta but could support non-stop service, particularly as the Indonesian economy continues to expand. 737-900ERs and A320s are likely too big for these kind of markets, making it challenging for LCCs to enter – although over time these markets could potentially become thick enough to attract LCCs. 737-500s are much smaller, seating only slightly over 100 passengers in two-class configuration. Sriwijaya had looked at acquiring Embraer E190s, which also seat about 100 passengers, for Nam. Sriwijaya and Embraer announced in Jun-2011 an order “subject to final documentation” for 20 E190s. But the order was never finalised and the delivery slots intended for Sriwijaya were allocated to other carriers. The group could ultimately re-look at large regional jets as a replacement for its ageing 737-500s and to accelerate growth at Nam. Sriwijaya is not the only airline group keen to open up new point-to-point routes with small jet aircraft. Garuda has a similar network strategy with its Bombardier CRJ1000 operation, which it began in late 2012 and is now operated under the sub-brand Explore Jet. Some of Indonesia’s smaller regional carriers also have started targeting similar markets by taking jets to supplement their turboprop fleets. For example, Sky Aviation began operating Sukhoi Superjet 100s in early 2013, using the new type to open longish thin regional routes. Sriwijaya seems keen to use Nam to test out new markets as it looks to secure a sustainable niche in Indonesia’s dynamic and highly competitive domestic market. This appears a lower risk strategy; using Nam primarily to increase capacity on trunk routes would expose it to the intense competition on the main routes. As a middle market carrier, Sriwijaya risks being squeezed out between the larger full-service players and the LCCs. 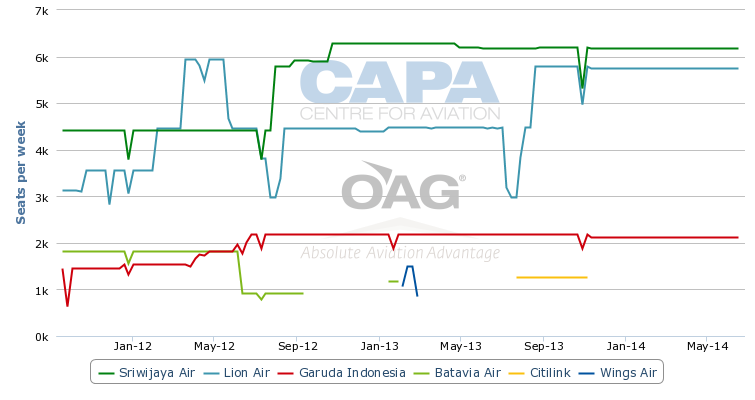 Another middle market carrier, Batavia Air, struggled to compete and ultimately succumbed. Sriwijaya lacks the cost structure to compete with LCCs and does not have the resources to match Garuda or Batik. But if the Sriwijaya group can succeed at identifying and pursuing growth in routes which are now un-served or under-served, its long-term outlook will be brighter. One factor it has in its favour is the strong underlying growth in the Indonesian market.